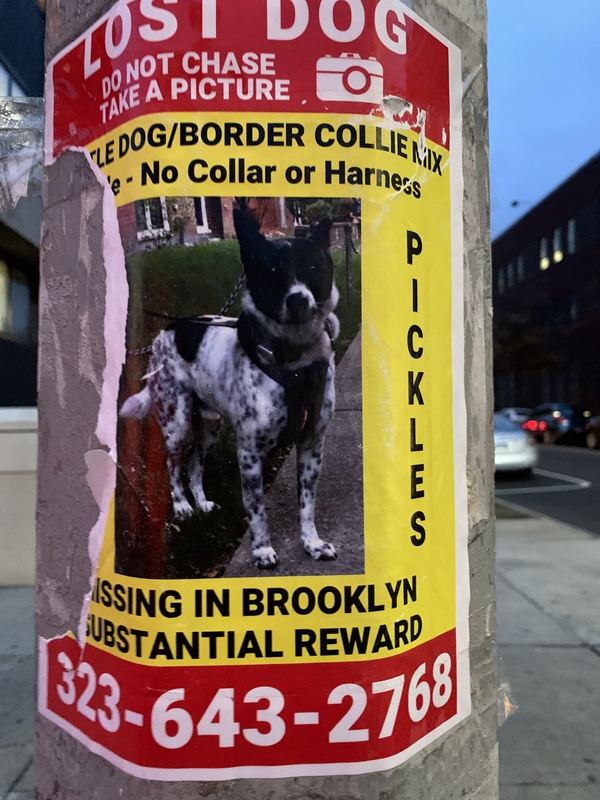 DITMAS PARK – It took three months, but finally Pickles the Dog, has been found. But wait, there’s more! Pickles brought along a friend, Violet, who had been missing since 2016! Today Pickles returned home to his family and Violet is safe at Sean Casey Animal Rescue, where she was being fostered from when she went missing. Here’s what happened. 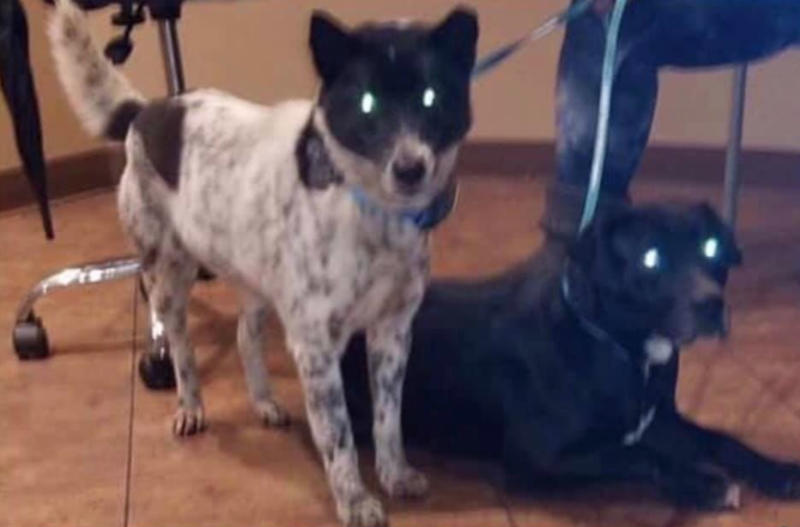 Pickles, a 7-year-old white/black Australian Cattle Dog/ Border Collie Mix, was adopted from Thailand by a Ditmas Park family a few years back. In Thailand, he was a street dog. In Ditmas Park, he went missing in August. Pickles was on a walk with a human from Wag!, a dog-walking service, when he ran off. His family in Ditmas Park, along with Wag!, had been searching for him all this time, taking to social media and placing 13,600 posters throughout several neighborhoods. Wag! set up a tip hotline that received 44 tips, organizing multiple search parties, and initiating pet amber alerts including over 14,700 robocalls through Lost My Doggie. 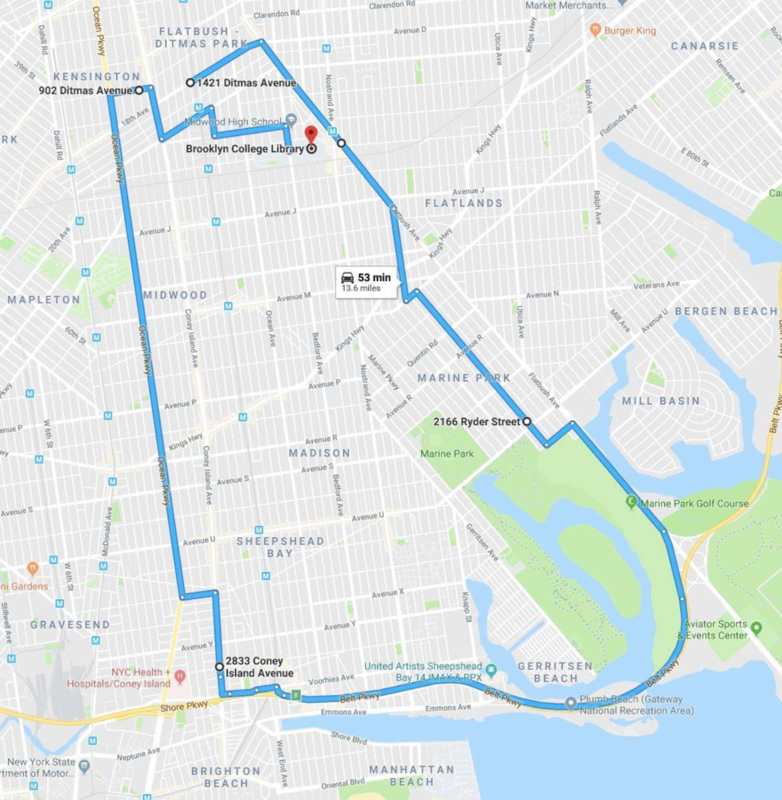 In the three months, Pickles was spotted in various spots across the borough, going as far as Gerritsen Beach. Map made by Suzanne Cellura Andow. In the end, it took professionals to track Pickles down. Wag! hired Carmen Brothers, a professional tracker from Virginia, and Teddy Henn, a professional trapper from Long Island, to track Pickles and trap him. Brothers tracked Pickles after numerous tips and by placing cameras at the train station behind Brooklyn College, and the following day, Henn trapped the dogs using some really good food. In his adventure, Pickles came across Violet. Violet is a foster dog who had been missing since November 2016, when she shook off her harness and ran from Cortelyou and East 17th Street running south toward Dorchester Road. “To me, this is the most amazing story. They found each other just in time for the holidays,” said Elisa Flash, the editor of the Lost and Found Pets in Brooklyn Facebook page that helps reunite lost pets with their owners. According to Flash, Pickles had gained some weight, which means that either somebody was feeding him or he knew where to find food. Now, the big question is: will Pickles’ family adopt Violet? This was UPDATED at 6:25 a.m. on Nov. 29 to include quotes from Jasmin Cruz. Awe! So happy to see this! I always prayed for his safe return every time I saw the poster! Including today! What happened to Violet? Did she belong to someone? I think the track record of how many dogs have been lost by Wag! needs to be pointed out! They still have not added any back-up protocols or proper leash handling or training for their walkers. You left out one more danger to pets that go missing, aside from the dangers of the streets. If they’re picked up and brought to NYCACC, chances are high they would be inhumanely murdered in a short time. NYCACC does not even give anesthesia before they administer the lethal injection that kills them. PLEASE microchip your pets and keep the info up to date. Is this real? Feels like I’m reading an onion parody with a fatten dog from Thailand (are there no dogs in BK? ), and professional dog hunters (do ppl make this stuff up?). The real dig: the owners leaving Violet at the pound. There is nothing left of Brooklyn. Wag needs to be put out of business and it’s staff jailed or worse. They are incompetent. @Sarah Scandiffio: Read the article. Violet did not have owners. She was being fostered. And as for the rest, well….I am glad there are caring people in the world and that these dogs are safe. No need to be grumpy. Go adopt a dog or make a donation. Seems like we’re not respecting the doggos’ expressed preference for freedom. Free Pickles. Free Violet. An amazing story! I really hope Pickles’ family can consider adopting Violet. And then post holiday pics of their new blended family. WE NEED THIS, NEW YORK. can pickles family come tear down all those flyers now please? Great and happy story! Well done Zainab, a beautiful story! A note for the owners (guardians) of Pickles . You don’t need to wait to adopt Violet. Pickles will teach her everything he knows about being a pet. I think so anyway based on our experience with adopting a feral dog (coincidentally named Violet) and. . She didn’t understand being a pet. She wanted her freedom, wanted to eat scraps off the sidewalk (she’d lived like this since she was born I think). But she’d been picked up on the side of a highway, outside New Orleans (where I was living at the time). She was practically untrainable. But when we brought her home to our brooklyn apartment to live with us and our older dog, Jo, she started to relax. She learned how to be a pet from Jo. How to fetch balls for treats, to sniff other dogs, how to play! So I’d say, forget Violets fostering. She didn’t , couldn’t learn from we humans. Take her home asap. They’re grieving now I’m sure for each other. My two cents!